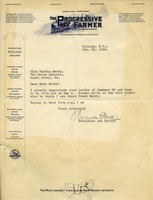 Martha Berry requests an itemized statement of her account at Browne's. She says she had hoped to visit when she was in Atlanta but she couldn't because of Commencement. 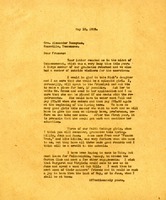 Martha writes back to Mrs. Bonnyman to tell her that she would be glad to take Nick's Daughter, and instructs her to have her send in her application. Martha also informs her that three of the Faith Cottage girls graduated that Mrs. Bonnyman will remember. Martha Berry asks Mr. Stewart if he would come to Commencement exercises for the Berry schools. She mentions also the peach trees and dogwoods in bloom. 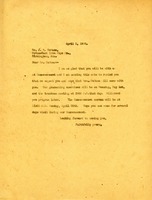 Letter forwarding a Recommendation Blank for the Pictorial Review Award for Dr. Poe to complete and thanking him for the commencement address. 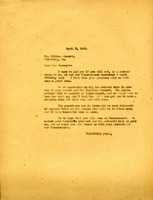 Acknowledging receipt of Mr. Poe's telegram regarding commencement. 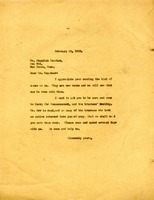 Mr. Green is forwarding material concerning the Berry Schools to Mr. Poe. Mr. Green indicates that approximately 6,000 students have attended Berry during the last 25 years. 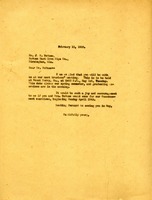 Mr. Green suggested that an address showing opportunities of country life would be timely. 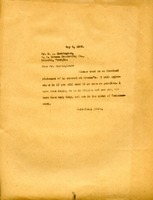 Clarence Poe requests additional information regarding his upcoming commencement address. The Berry Schools write to thank Mr. Poe for his acceptance of the position of Commencement speaker as well as to explain the train schedule. 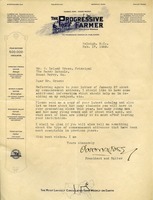 Letter from Clarence Poe, President and Editor of The Progressive Farmer, accepting an invitation to deliver commencement address on May 1. 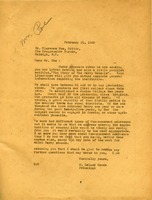 Letter requesting Clarence Poe deliver the commencement address at the College and High School graduation. 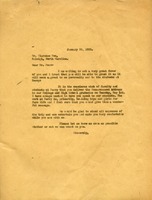 Joseph Orr writes to Martha Berry to inform her that Mrs. Orr's illness might prevent him from being able to attend commencement. 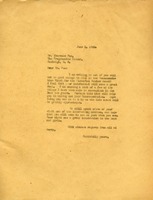 Richard Orme Flinn writes to Martha Berry to express his appreciation for her courtesy during his visit to the Berry Schools. He goes on to provide her with the contact information for Dr. Magill, who is raising funds for deserving institutions, and Dr. Wm Ray Dobyns, pastor of the South Highland Presbyterian Church in Birmingham, Alabama. He also suggests Dr. C. Frank Morgan of the First Church in Augusta, Georgia, if she wants an "outstanding" speaker for the Berry Schools' next commencement or perhaps J. Blanton Belk of Orlando, Florida. 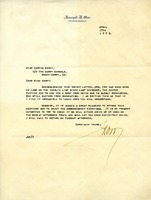 Finally, he hopes that Martha Berry would "remember" him "most cordially" to Mrs. Wright. 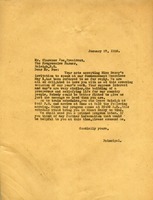 Letter to Standish Meacham thanking him for sending her a list of names. She informs him that she will see what can be done with the names. She also asks him to come to commencement as well as the trustees meeting because the school needs new trustees because all of the other who took an active interest in the schools have passed away. She asks him to come and spend a few days with them as well. Martha Berry reminds J. R. McWane that she is expecting him to come to the Commencement ceremony and promises to send him the details of the program later. Martha writs to Mr. McWane glad that he will be able to be at the next trustee's meeting and hopes he and his wife will come for Commencement in April.